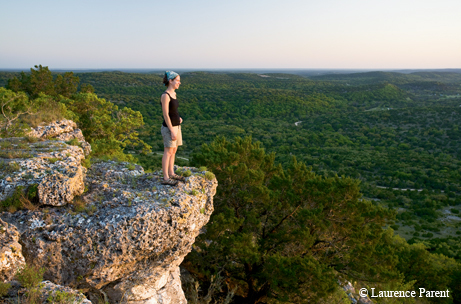 ﻿﻿TPWD partners share their love of Texas’ natural wonders. ﻿﻿﻿From the indomitable peaks of the Franklins to the Big Thicket pines, from the dusty plains of the Panhandle to the swaying Gulf palms, Texas has natural wonders to suit all tastes. For the past two years, we’ve shared some of our favorites here in our annual “Best Of” feature. This year, we’ve asked some of our friends to join in the fun. These aren’t just casual acquaintances. Hand in hand, we work with these partners to preserve these treasures for generations to come. Not surprisingly, many of them found paradise right in their own backyard. So can you! ﻿﻿Kayaking on the Devils River. The Devils River, in a remote part of Southwest Texas, is the most unspoiled river in Texas or maybe even the entire Wild West. More than 90 miles long, the river winds through beautiful canyons and desert landscapes that display little evidence of people. These clear and pure waters remain so because the river is protected by miles of private lands on both sides, and a portion of it runs underground through a natural rock and gravel filter. While it is not for amateur paddlers because the conditions are unpredictable and often harsh, the rewards are worth the risk for those skilled and willing to take on the challenge. The river boasts both world-class scenery and a little-known fishery for smallmouth bass that is unrivaled anywhere. Many young anglers catch their first fish at the Texas Freshwater Fisheries Center in Athens, which makes it the best place to play catch in the state. Young anglers learn how to bait a hook at the 1.2-acre stocked fishing pond. They catch sunfish and catfish year-round; rainbow trout are stocked from December through March. No license is required for adults or children, and all bait and tackle are furnished. Visitors to the Texas Freshwater Fisheries Center can also explore the 300,000 gallons of aquariums with native Texas fish, watch the daily dive show, take a tram tour of the hatchery and walk the interpretive wetland trail for bird watching and turtle spotting. ﻿Please Don’t Make Me Choose! As a native Texan, I can state unequivocally that being a Texan is both a state of mind and of heart. As a marine scientist, I have explored the coastal waters of Texas for more than 40 years. As a citizen, I have explored the lands of Texas east to west and north to south for more than 60 years. Texas is home! As hard as I might try, I cannot cite any single location as my favorite. On Padre Island National Seashore, I am struck by the realization that for thousands of years the waves have been rolling onto these shores, and at one time the Karankawa Indians roamed the island. At the Flower Garden Banks National Marine Sanctuary, I am awestruck by the life of a coral reef. Giant whale sharks, manta rays and hammerhead sharks cruise over the coral and clouds of brightly colored tropical fish. The vast ranchlands of South Texas are a wealth of history and nature, their immensity almost incomprehensible. Big Bend National Park exhibits the opposite extreme from the coastal wetlands, being so dry and rugged. The Pineywoods of East Texas and Caddo Lake offer a lushness of green. North Texas offers Palo Duro Canyon and, according to old-timers, “lands separated from the North Pole by only a barbed-wire fence.” Whether wet or dry, Texas is a marvel of nature. Beaumont has so many outdoor attractions, from birding at Cattail Marsh (inside Tyrrell Park) to learning about alligators at Gator Country Wildlife Adventure Park. Explore the Neches River, one of the last wild rivers in Texas, whether you prefer to fish or take a guided riverboat tour. Take a canoe trip through the Big Thicket National Preserve and camp at Village Creek State Park for some great hiking and birding. If you love flowers and foliage, check out the Beaumont Botanical Gardens and the Warren Loose Conservatory, or take a side trip to Shangri La Botanical Gardens in nearby Orange. There are a million options for nature lovers. Birders from across North America flock to Rockport every winter to enjoy what is arguably the finest bird-watching terrain anywhere in the world. Migrating hummingbirds (the smallest bird) herald the arrival of the annual HummerBird Celebration, and the endangered whooping crane (the tallest bird) descends every winter in the Aransas National Wildlife Refuge. More than 350 bird species can be found in the refuge. ﻿﻿Glass-bottom boats at Aquarena Center. 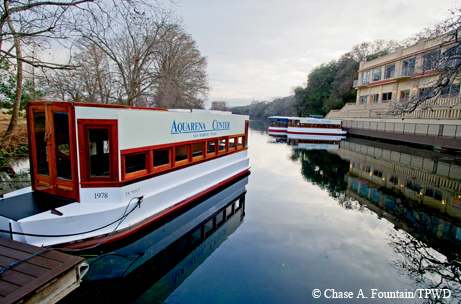 Many Texans in my generation grew up making an annual pilgrimage to a special place that for nearly 50 years was called Aquarena Springs Resort, located today on the campus of Texas State University in San Marcos. The heart of the resort, which featured Aquamaids and swimming pigs, was San Marcos Springs, the second-largest cluster of artesian springs in Texas. Archaeologists believe this site, discovered by Spanish explorers in the early 18th century, is one of the oldest continuously inhabited places in North America. The natural history of the springs is equally special, as they are home to a whopping eight endangered or threatened species. Today, the site has been fully restored, and virtually all remnants of the resort era have been removed (the glass-bottom boats remain), allowing the current generation of children to see this lovely place in its natural condition. If you got me in a hammerlock and forced me to choose my favorite critter, I’d pick the dung beetle, also known as the tumblebug. What a monumental job it has! Imagine being charged with keeping our soils alive by burying all the dung you happen upon. ﻿﻿Hill Country State Natural Area. My pick would be the Hill Country State Natural Area. The name says it all. Perfect peace and quiet interrupted only by the chirping of birds and the occasional sound of horses’ hooves and hikers’ boots. There are more than 40 miles of trails to enjoy. A true treat is to stay at the lodge with a group of friends. The stars are bright, and the silence is golden. My favorite natural place in Texas is the beach at Mustang Island State Park. This stretch of sand near Corpus Christi offers memorable Gulf sunrises that paint the sky with every color of the rainbow. My family enjoys the serene environment at the park, where we fish, tell stories around the campfire, build sand castles and comb the beach for shells (winter is the best time to find them). After a day of playing in the sand, I head off for the paddling trails that follow the western shoreline of Mustang Island in Corpus Christi Bay. Even though my kayak is a one-seater, I always end up with one of my kids in the boat with me. That’s because they know that the trails pass through some of the best shallow-water fishing areas in Texas. The last time we were coasting along the edges of Shamrock Island, my daughter and I watched a stingray dance across the sandy bottom just inches below the boat in the clear, calm water. 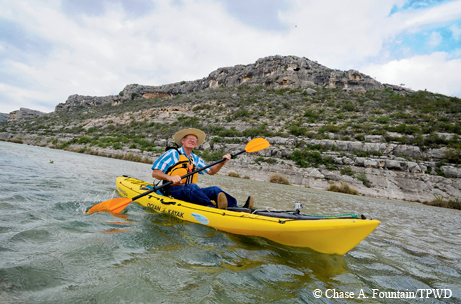 We can either fish, bird or paddle along peacefully — that’s what makes it the perfect natural place in Texas! ﻿﻿Bird watching at Quinta Mazatlan. Quinta Mazatlan, just minutes from the McAllen airport, is a 15-acre urban sanctuary. Visitors will enjoy a historic adobe home built for people, surrounded by a historic thorn forest built for wildlife. Granite gravel trails take you through the forest where you can meet South Texas natives like plain chachalacas, green jays and olive sparrows. The red brick road will take you to the historic adobe mansion with a beautiful courtyard, gardens and ponds. Kick back and soak up the sun. Splash in the warm Gulf waters. Cast for redfish from your Adirondack chair. Construct a regal sand castle. Search for sand dollars and other sea treasures. Boogie-board away boredom. Challenge yourself to windsurfing or kiteboarding. Do it all or nothing at all, at little to no cost. Whether soaking up the natural serenity or taking it to the extreme, there is something for everyone in the sand and surf of Port Aransas. 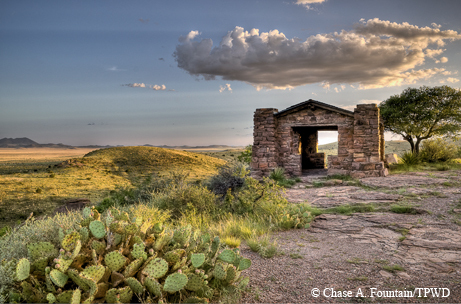 In 2010, I had the opportunity to be a writer-in-residence near Davis Mountains State Park for two months. Often when I needed to think things through or hit writer's block, I would go to the park to hike. Usually a good mile or so jaunt would reveal the right phrase or the next paragraph. Enough so that On Politics and Parks was completed and is selling very well indeed. A great deal of the book is devoted to our national and state parks and the great contribution they make to society and the individual. Each December, the Nature Conservancy’s Clive Runnells Family Mad Island Marsh Preserve throws open its doors to visitors for the National Audubon Society’s Christmas Bird Count. With 7,000-plus acres of coastal marsh and wetlands, Mad Island Marsh Preserve is situated along the Central Flyway, one of four principal migratory bird routes of North America. For nearly two decades, Mad Island has garnered top honors as the largest and most diverse bird count in the country. Throughout the year, as many as 250 different species of songbirds, shorebirds, wading birds and waterfowl call the preserve home. But it’s not just for the birds — an array of marine creatures and other animals, from blue crabs, brown shrimp, southern flounder and speckled trout to alligators, bobcats, armadillos, white-tailed deer and coyotes, can be found there, too. Sounds crazy, right? Where can you surf a couple of hundred miles inland? The San Marcos River bubbles to life from hundreds of springs right in the center of town, and folks love to surf — yes, surf — at Rio Vista Dam. Always a refreshing 72 degrees, this natural wonder is enjoyed year-round to cool off or warm up. Grab a tube and go for a float. Rent a kayak or stand-up paddle and navigate its length. Bring your snorkel and discover its depth. Or just bring a picnic and soak up some sun. The Lone Star Hiking Trail is more than 120 miles long and runs from the tiny town of Richards at the west end to Montague Church (just east of Cleveland) at the east end. Much of it goes through the Sam Houston National Forest, and very little of the trail is “road walking.” The trail crosses rolling hills of tall pine forest and hardwood bottomlands with magnolias and rare beechnuts. It crosses two rivers, one named bayou, a number of swamps and flowing springs, and some very big creeks. The trail passes through both Huntsville State Park and the Double Lake campground, and is a joint effort of the Sierra Club and the National Forest Service. One lesser-known natural treasure can be found in Lady Bird Johnson Municipal Park in Fredericksburg. A small 10-acre tract along Live Oak Creek was left undisturbed and somewhat forgotten for decades while the municipal park was developed. Through thousands of hours of volunteer labor since 2000, this tract is now the Fredericksburg Nature Center, boasting more than 6,000 feet of hiking trails, with two loop trails and a 650-yard wheelchair-accessible trail. 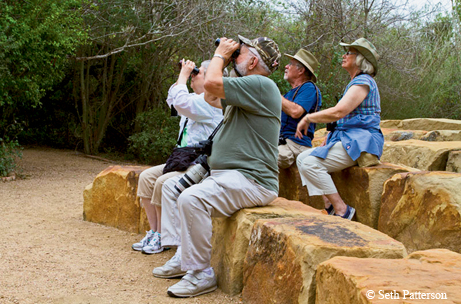 Since Fredericksburg is located in the center of several geological and biological regions, visitors to the Fredericksburg Nature Center will find seven distinct habitats with an amazing diversity of over 650 species of birds, forbs, grasses, woody plants, amphibians, reptiles and insects. Species lists can be found at www.fredericksburgnaturecenter.org for those with “life lists,” or just come experience the incredible natural beauty the German settlers in the Texas Hill Country first encountered in the 1840s. My favorite natural place in Texas is the largest group of springs in the state, Comal Springs. Most folks think of the Comal River in New Braunfels as a summer place for water recreation, but my favorite time there is the winter. The warm water temperature (a constant 73 degrees) clashes with the cold air and creates steam that floats above the river, sometimes 10-plus stories into the air, creating narrow steam funnels. After hurricanes, misplaced coastal birds like pelicans enjoy our natural springs and are reluctant to return home. Spring means babies on the river: ducklings, nutria, fawns, turtles and migratory birds. Summer brings water recreation of all kinds. In the fall, cypress trees provide a colorful display. Folks are beginning to discover the Neches River, a historic natural treasure flowing through the heart of East Texas. 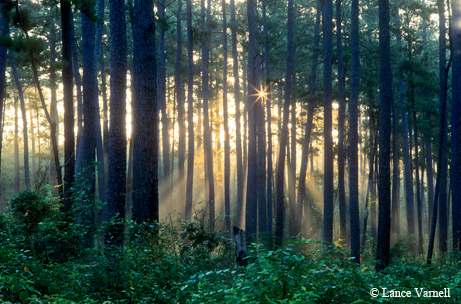 The Neches bottomlands sport some of the best hardwood forest habitat left in the country. Author Richard Donovan calls the Neches the “interstate” of the North American Central Flyway, used by millions of ducks, geese and songbirds as they migrate each spring and fall. The Davy Crockett Paddling Trail attracts 300 people each June during the Neches River Rendezvous. The Angelina-Neches/Dam B Wildlife Management Area (at the fork of the Neches and Angelina rivers, near Martin Dies Jr. State Park and the Big Thicket National Preserve) is nurtured by this special river. Getting on the river takes a paddler away from the sounds of highway and machinery and toward the twitter of songbirds, the scream of a hawk and the splash of an otter. Its ever-changing beauty is exciting, no matter the season. There’s a reason many visitors, both feathered and human, flock to Anahuac National Wildlife Refuge each year. Located 18 miles southeast of Anahuac, the isolated, 34,000-acre refuge has been a popular destination for bird enthusiasts wanting to gaze at the 279 avifauna species that call it home at some point each year. The refuge’s southern border consists of nearly seven miles of pristine Galveston Bay shoreline. This important coastal marsh habitat serves as the basis for the estuarine food chain, improves water quality in Galveston Bay and acts as a buffer during storms. It is also a crucial food source for migratory bird populations crossing the Gulf of Mexico. Many people don’t realize that there are parts of Galveston Bay so serene, ecologically diverse and remote. McHale Park in Seabrook is on the Great Texas Coastal Birding Trail. There, brown pelicans can be seen soaring over the water with a 6-foot wingspan and plunging 40 to 50 feet into the water after fish. The special adaptations of air sacs in their chests and long 18-inch bills cushion the blow when they hit the water bill-first. The amazing pouch holds about 2.5 gallons of water; the pelican will drain the water and toss its head back to swallow the fish. 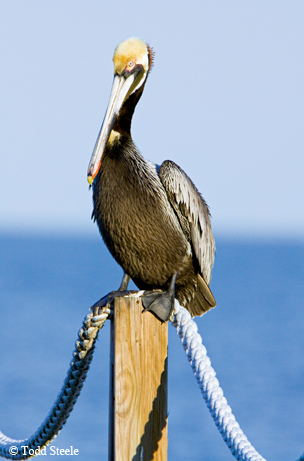 Between 1967 and 1974, there were fewer than 100 brown pelicans in Texas. They almost disappeared from Texas because of the pesticide DDT, which caused eggshells to be thin and susceptible to breakage during incubation. DDT was banned in 1972, and the number of these magnificent birds has steadily increased. The Wildlife Center of Texas has released many rehabilitated brown pelicans at this park after their recoveries from fractured wings, parasites and oil spills.